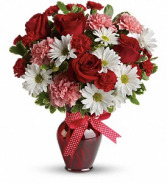 Whether for your significant other or your sister, aunt or grandmother, this delightful floral gift is a sweet way to say "I love you." A Bloomshop Custom Design! 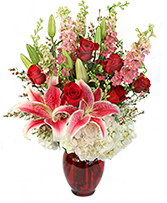 We add glitter and floral spray to create this unique arrangement. 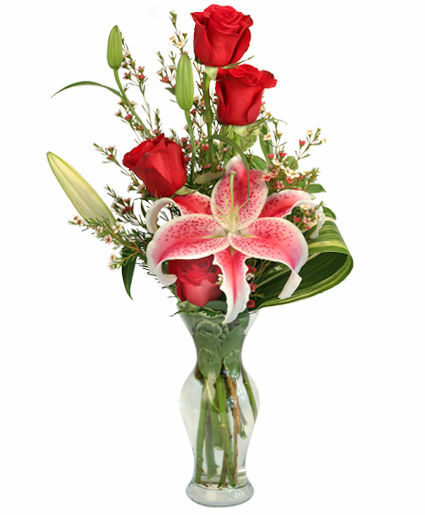 It includes 1 Dozen Longstem Red Roses, Pink Lilies, and white daisies (sprayed pink). Finally, Bells of Ireland are tied in the shape of a heart to top it all off! 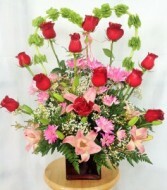 We specialize in filling last minute orders! For fastest service, please call us immediately at 210-265-5569 or 210-265-5736. We are now open on Sunday from 10am - 4pm; please call or come in to place an order for that day!